comes from the story of Amaterasu (a famous mythological story about the Sun Goddess/Amaterasu-O-Mikami, and how Ame-no-Tachikara-O was able to bring her back from her sequestered cave (pulling her with his strength) which represents essentially how the Sun rises each morning.) So, Ame-no-Tachikara-O represents our inner will to persevere and have strength in times of struggle (or even darkness and depression). Motivate (yourself), motivate! Go forward to win! That’s where the (rest of) the dumb (stupid) world lives. What do you do if you don’t cry? Crying tears myself, afraid if I stopped. With an empty gas tank, I was finally motivated. Now that I’m going, the (fuel gauge) is full. Hot, hot, hot, HOT! We feel! “Step, by step, by step, one more step!” I cried! Don’t stop! Keep going on! Yes! We’ll keep the fire burning! Ame-no-Tachikara-O: You are your own worst enemy. Ame-no-Tachikara-O: Look beyond yourself towards heaven. It’s hard to be so simple. But anything becomes complicated if you think too much (about it). I don’t know what comes second, Mama. Chasing, chasing… I fell down. I could have been hurt, but I wasn’t. No need to hold back anymore, I’ll lead! Is the path I chose, correct? Even I became nervous at the thought. Hotly, hotly, hotly, hotly blazing souls! Don’t worry about raising the temperature of the Earth! One by one, piled up: one, two three. Let’s believe you are your own answer! Yes! We become greater as we burn (together)! Let’s become a RED fighting sprit that can do anything! “Step, by step, by step, one more step!” I cry! Original nihongo lyrics here http://www.kasi-time.com/item-55204.html – ももクロのニッポン万歳! (日本万歳/歌詞) Romajii lyrics – see the About section on the below YouTube video (or the end of this post). [“Hyoito”: phonetically like a bubble sound pop, pop, pop, pop, pop, or howling, or barking…] Japan! <pop> Look a Tokushima temple! <pop> Kansai bound for us! 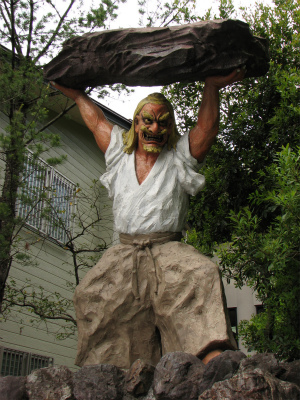 <pop> Kaga-Hyaku-Man-Goku (old name for Kaga 1 million dollar city), Ishikawa (prefecture)! Aomori apples and Teppan (yaki – grilled dining)! konamon wa kansai no hokori ya de–! !